Quickly learn to program in C# programming with this unique book and video package C# 24-Hour Trainer, 2nd Edition is your quick and easy guide to programming in C#, even if you have no programming experience at all. Updated to align with the latest C# standard, this book is your comprehensive beginner's guide, with each lesson supplemented by a video, for over ten hours of video training. Each ch… apter focuses on a specific concept or technique, with detailed, easy-to-follow explanation followed by a hands-on exercise. The goals of each exercise are outlined in advance to help you understand what you're working toward, and step-by-step instructions walk you through the operation from start to finish. Complex areas are clarified with specifically highlighted pointers that head off confusion, and additional exercises are provided so you can practice your new skills. Full instructor ancillaries are included to make this guide classroom ready, and the author's own website offers ongoing support. C# has become one of the most popular programming languages in the world, with millions of lines of code used in businesses and applications of all types and sizes. This book helps you dive right in so you can start programming right away. Start right in with the latest C# standard Learn at your own pace, with hands-on practice Clear up confusion and work around common obstacles Build your own Windows, .NET, and mobile applications C# has become a increasingly popular and in-demand programming skillsets. 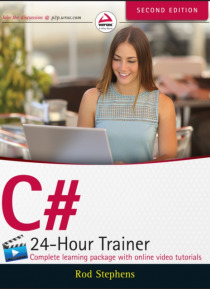 If you've decided to learn C#, this 24-Hour Trainer is your ultimate guide.